Bristol, set inland on the Avon River and with access to the Bristol Channel, has an illustrious history as one of England's oldest ports. It was a favored port of departure for the New World following John Cabot's voyage to North America in 1497. To celebrate that event, Cabot Tower in Brandon Hill Park was erected on the 400th anniversary of Cabot's voyage. 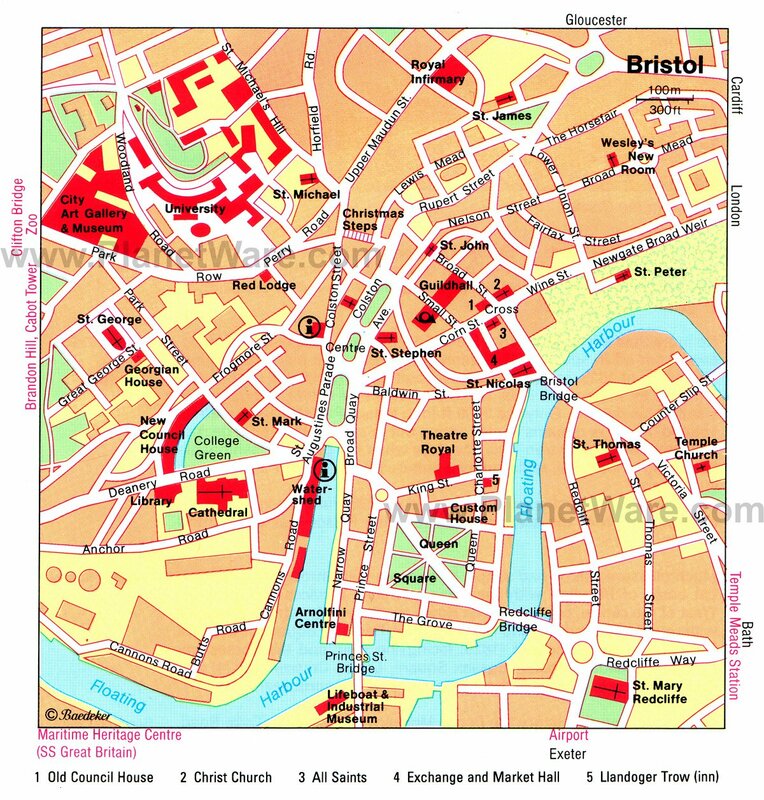 Bristol was also a trading center and Royalist headquarters during the English Civil War. Shipbuilding has been a pillar of Bristol's economy for centuries, reaching its pinnacle with I.K. Brunel's SS Great Britain. Built in 1838, this was the first steamship to make regular Atlantic crossings. In addition to designing the famous suspension bridge spanning the Avon Gorge, Brunel was also the engineer in charge of completing the Great Western Railway between London and Bristol. Among Bristol's tourist attractions are 30 art galleries and a number of parks. For families, there's Bristol Zoo Gardens and At-Bristol, which is especially designed to engage young minds. Ashton Court Estate provides a wide variety of outdoor activities. Between all these and a day trip just outside of town to Cheddar Gorge, you'll find plenty of things to do during your stay in Bristol. The old Port of Bristol on the Avon River has been given a new and imaginative lease of life, its many wharves and warehouses restored or converted to contemporary uses. Traditionally known as the Floating Harbour, the area is now home to museums, galleries, exhibitions, the Bristol Aquarium, At-Bristol Science Center, and the Arnolfini visual arts, music, and performance center. M Shed is a museum that concentrates on the history of the city from prehistoric times to the present. Outside the M Shed, you can see locomotives and the Fairbairn Steam Crane, the oldest surviving of its type in Britain, which worked around the clock during World War II handling assault landing craft. Four other cargo cranes recall the city's trading heyday in the 1950s. Travel in Bristol is made easy by Bristol Ferry Boats, which operates five ferries on the Avon River. Inexpensive passes let you hop on and off. When Queen Elizabeth I visited Bristol in 1574, she described St. Mary Redcliffe as "the fairest parish church in England." Built in the 13th century and extensively renovated in the 15th century in the Baroque style, the church is located on the south side of Floating Harbour and takes its name from the red cliffs on which it stands. With its slender, clustered pillars and reticulated vaulting, hexagonal porch, and richly decorated doorway, it perfectly displays the wealth of Bristol's rich merchants. A great triptych, Sealing The Tomb, designed and executed for the main altar by William Hogarth, is now at the offices of the Bristol & Region Archaeological Services in the former St. Nicholas Church. Also of note is the memorial tablet and tomb of Admiral Sir William Penn, father of the William Penn who founded Pennsylvania. Originally the church of the Saint Augustine Abbey, Bristol Cathedral took almost 600 years to achieve its present form. The east end, superbly rebuilt in the Decorated style by Abbot Knowle, dates from between 1298 and 1330. The central tower and transepts were completed in the 16th century, and the nave and towered west facade are from the 19th century. The church was elevated to cathedral status in 1542. Among the interesting features of the cathedral is the rectangular chapter house, with its late Norman decoration of zigzags, fish scale patterns, and interlacing. Also look for the Great Gatehouse, built in 1170 as the gatehouse for the St. Augustine Abbey. It has early examples of the use of pointed arches. The SS Great Britain, the world's first iron-hulled passenger ship, lives on at the same dock from which the great vessel was launched in 1843. The work of the famed engineer Isambard Kingdom Brunel, it also was the first use of screw propellers on a ship. Located at Bristol's Great Western Dock, the ship is a testament to Brunel's engineering ingenuity. Today, you can stroll the ship's upper decks or explore below decks and peep into the luxury cabins of First Class passengers. The site is also home to the Brunel Institute and the David MacGregor Library, an archive of thousands of books, documents, plans, and objects related to England's greatest engineer and inventor. The famous triple-gabled, half-timbered Llandoger Trow building in King Street, built in 1664, is where Alexander Selkirk is said to have told the story of his shipwreck to Daniel Defoe, who immortalized the tale in Robinson Crusoe. The Llandoger Trow was also the model for the Admiral Benbow, the inn frequented by Long John Silver in Robert Louis Stevenson's Treasure Island. Carefully restored in 1991, the building is linked by an underpass to the Theatre Royal, home of the Bristol Old Vic and the oldest playhouse in England to have had its stage in continuous use. Another work of the famed British engineer I. K. Brunel, Clifton Suspension Bridge spans the 260-foot-deep Avon Gorge on the west side of the limestone plateau known as Clifton Down and Durdham Down. Measuring 702 feet between its piers, the bridge was completed in 1864, 33 years after Brunel had first submitted his prizewinning plans. Stop at the visitor information center to learn about the bridge's construction or join a weekend behind-the-scenes tour. Watch for peregrine falcons flying above the Clifton side and climb Observatory Hill in Clifton for a bird's-eye view of the bridge. The Clifton Observatory is also the place to see the Camera Obscura and Giant's Cave. Bristol Old City is a warren of historic buildings from a long stretch of the city's history. St. Stephen's Church on St. Stephen's Avenue is the parish church of Bristol and dates from 1476. Look inside for the tomb of Martin Pring, the discoverer of Cape Cod Bay in Massachusetts, and for the colorful effigy of George Snygge. The medieval St. John on the Wall is close by, the last of the many churches once built into the city wall. It is noted for its vaulted crypt and interactive displays added in 2016. It is near St. John's Gate, originally part of the old city wall, famous for its figures of Brennus and Belinus, mythical founders of Bristol, and Christmas Steps, an ancient alleyway paved in 1669 and now lined with antique and souvenir shops. At the corner of Broad Street and Corn, you will find the Neoclassical Old Council House, constructed in 1827. Across Corn Street, the Palladian-style Exchange (built in 1743) is noted for its four outdoor tables, the brass "nails," upon which Bristol merchants settled their transactions and gave rise to the expression "paying on the nail." The covered St. Nicholas Market, with more than 60 stalls, is adjacent to the Exchange on St. Nicholas Street. A Farmers Market is held on Corn and Wine Streets on Wednesdays. Part of Bristol Museums, an association of six fine museums in the city, Bristol Museum and Art Gallery has three floors filled with Egyptian mummies, wildlife, dinosaurs, gemstones, glass, pottery, oriental arts, and a collection of Old Masters. An entire section is devoted to I. K. Brunel and his many technical achievements. The nearby Red Lodge (closed Jan to April), with its old furniture and fine Elizabethan room, focuses on the human side of history. Also at a separate location and open seasonally, the Georgian House Museum tells the story of an 18th-century merchant, sugar plantation owner, and slaveholder through his house and possessions. A late 18th-century mansion house and estate, Blaise Castle House provides a feel for the lifestyle of a prosperous family on a country estate. The Picture Room, with a domed glass ceiling, is decorated with paintings, and the house is known for its collections of children's toys, including doll houses and furniture, trains, and toy soldiers. On the estate are ruins of Kings Weston Roman Villa, with baths, a heating system, and mosaic floor. The house and Roman villa are closed January through March. Just 18 miles from Bristol, Cheddar Gorge makes an excellent day trip. Highlights of this National Nature Reserve include its dramatic 450-foot cliffs and stunning stalactite caverns. Other attractions include the spectacular Gough's Cave, with its hidden chambers, as well the soaring chambers of "St. Paul's Cathedral" and the towering spires of "Solomon's Temple." You need a degree of fitness to tackle some parts of the gorge, including the 274 steps up the side of the gorge and the 48 more to the top of the Lookout Tower. Entry includes the cliff-top walk and the Cheddar Man Museum of Prehistory. Bristol Harbour Hotel & Spa: luxury boutique hotel, Venetian-style buildings, illuminated indoor pool, upscale spa, afternoon tea. Holiday Inn Bristol City Centre: mid-range pricing, near shops, great showers, contemporary decor, 24-hour room service. The Bristol: affordable rates, harbor views, stylish decor, comfortable beds, Nespresso machines. Premier Inn Bristol City Centre: budget hotel, convenient location, modern room decor, multilingual staff.